BMW says its new Z4 is selling well. MUNICH -- Germany's three luxury brands posted sharp drops in their new-car sales in May, but said new models were helping slow the rate of decline. Global sales of BMW brand were down 18.1 percent to 90,643 while Mercedes-Benz brand sales dropped 12.1 percent to 86,300 and Audi's volume fell 6.1 percent to 82,800. BMW said the drop was more moderate than in most of the previous months and the carmaker still expects to be the top-selling luxury car brand in 2009. "We were able to increase our market share in the premium segment in major markets such as the U.S. and Japan over the previous month," Ian Robertson, BMW sales and marketing chief, said in a statement. "That puts us right on track to maintain our position as the world's No. 1 premium manufacturer in terms of sales volume in 2009." 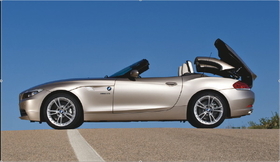 The carmaker says its new BMW Z4 is off to an excellent start with 2,365 customer deliveries since its launch on May 9. The new BMW 7 series also is selling well with sales up 1.5 percent to 3,370 in May. BMW group sales including the carmaker's Mini and Rolls-Royce brands were down 18.3 percent to 109,042 in May, compared with the same month in 2008. Mini's sales fell 19.1 percent to 18,348 units. In Germany, Mini's volume rose by 11.8 percent to 3,569. Rolls-Royce sales more than halved to 51 units in May. In the first five months, BMW group sales are down 21.1 percent to 487,906. Through May, BMW brand sales were down 20.9 percent to 408,370; Mini sales declined 22.6 percent to 79,260; and Rolls-Royce was down 27.6 percent to 276. Sales of Daimler's Mercedes-Benz unit including Smart fell 12.4 to 97,300 in May but Germany and China were bright sports for the carmaker. In Germany, Mercedes-Benz sales increased by 11 percent to 25,600 helped by strong demand for the new E class and A- and B-class cars. A class sales in Germany rose 54 percent to about 5,300 while B class sales were up 27 percent to 3,900. Smart ForTwo sales increased by 26 percent to 3,200 units. In China, Mercedes' sales rose 67.5 percent to 5,500. The brand's sales in western Europe fell 6.7 percent to 59,000. Mercedes' U.S. sales declined 33.4 percent to 16,300 in May. Audi said it expanded its position as the top-selling premium brand in western Europe despite a 10.9 percent sales drop in the region. It did this by increasing its market share in European countries outside Germany. In western Europe, Audi sales fell to 52,650 but sales were up in markets including Italy (7.1 percent), Belgium (7.3 percent), Austria (17 percent) and Switzerland (7.6 percent). In Europe excluding Germany, Audi said its market share rose to 3.9 percent from 3.7 percent last year. In the U.S., Audi sales in May were down 12.1 percent to 7,503. In China, Audi's volume was up 28 percent to 12,425 in May, the third-consecutive record month for Audi's sales in the country. In the first five months, Audi's global volume declined by 12.1 percent to 374,750 vehicles. Audi's sales and marketing boss, Peter Schwarzenbauer, said the carmaker's new Q5 SUV had helped drive sales in both Europe and the United States. “Demand for our A3, A4 and A5 core models is strong,” he said.